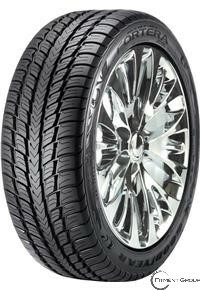 A high-performance tire with style, for large diameter wheels. The innovative sidewall design and sporty-looking directional wraparound tread pattern help enhance the look and style of your vehicle. Rim protector helps protect wheels against accidental curb damage. Reinforced shoulder blocks help promote even treadwear. Deep non-skid tread elements with high sipe density help promote enhanced all-season traction.